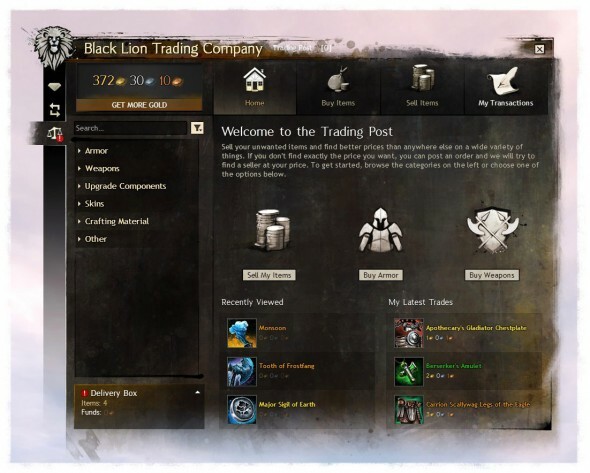 As part of the upcoming feature pack for Guild Wars 2, we’ll be shipping a change that’s been a long time in the making: a brand-new Trading Post! We’ve put a lot of work into it to streamline the most common actions and clarify what’s happening when you’re using it. As part of the streamlining, we’ve cut down the amount of work required for getting what you need, significantly expanded searching and filtering options, and even fundamentally rethought the UI. Where’d All the Tabs Go? Previously the Trading Post was built using four UI tabs: Browsing, Selling, History, and the Pick-Up tab. We haven’t fundamentally changed that structure, but the implementation has been completely reworked. We did away with the four UI tabs in favor of navigation that’s closer to the Gem Store so now switching between them is nearly instant. It’s required a total rewrite of the Trading Post front end, but the results are worth it. As part of this process, the Pick-Up tab has been removed, but we don’t think you’ll miss it. We’ve built a brand-new way to retrieve your coins and items, the Delivery Box. Best of all, it’s always available no matter where you are on the Trading Post. You can now see at a glance whether you’ve got coins or items to pick up, and of course it automatically updates as new sales complete. 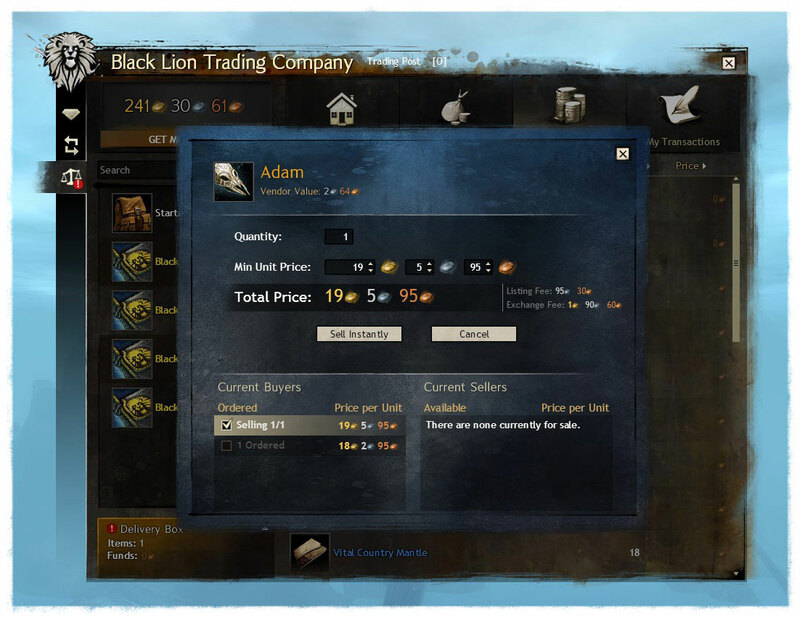 You can also expand it to get more details about the items waiting for you when you visit a Black Lion Trading Company representative. The Trading Post has a vast array of items available on it, one of the benefits of a truly global economy. No matter what you need, you’re almost always going to be able to find someone selling it. The multitude of items being sold on the Trading Post does have one unfortunate downside—it can be tough to find the item you want! The first iteration of the Trading Post didn’t do a great job of exposing its offerings to users, and that’s something we’ve worked hard to improve. To help facilitate finding items that matter to you, we’ve been focusing on two different but related ways of using the Trading Post: browsing, for those who aren’t sure exactly what they want, and searching, for folks who’ve got their eyes on a particular item. The biggest step toward getting the browsing experience squared away was ensuring that the Trading Post shows sensible, easy-to-select categories that align with users’ interests. We’ve done away with the requirement to open a panel just to get at high-level filtering options like categories and instead put them into a persistent panel on the left side. Now it’s easier than ever to browse and jump between categories. Searching has always been integral to the Trading Post experience, and we’ve worked to really polish it and ensure that it’s better than ever in this release. Search is now integrated with the persistent categories on the left, so you can easily narrow down your searches to just specific categories. Searching through the entirety of the Trading Post’s data is still easy, but now it’s just that much easier to filter down to exactly what you want. These new, easier-to-understand categories are really just a streamlined way of allowing you to filter items. This is probably the most visible aspect of how we’ve beefed up the filters available to you, but it’s certainly not the only one. Adding these new filtering options is a good start, but it was important that we also increased the visibility of your current filter settings. It’s all too easy when hunting for that one perfect item to complete your look to overfilter, leaving you with no useful results. Fortunately, we’ve got a couple of improvements to the search workflow that should help. Filters are now applied to search results immediately, making it easier to know if you’re heading toward a useful result. The Trading Post now shows you exactly which filters you’ve applied above the list of results, and removing any one of them is as easy as clicking on them. This way, you should never be surprised by the results if you forget that you left a detailed filter enabled. A big part of the rework has been identifying areas in the Trading Post where you’re doing similar things and trying to ensure that those all work the same. You can see that work in the new left-side categories, bags, and transactions tabs, or the unified filter display above items. It’s perhaps most obvious, though, when you’re buying and selling items. One of the biggest challenges about the Trading Post has been ensuring that users understand what’s happening. It’s not terribly common to have a game market that works more like a stock market than an auction house, and that means that we need to do a great job of messaging. Never is clear messaging and useful, timely feedback more important than when you’re about to spend some gold or sell one of your hard-won items from your inventory. Buying and selling on the Trading Post both share an awful lot of similarities: they’re both item focused, they both involve choosing a quantity, and they both benefit from showing you existing listings to help you make the best decisions. The more we looked at this, the more we were sure we could build a solution that would unify the experience. The new unified order dialog provides a more intuitive and interactive way for you to buy, sell, or just check the market for an item from anywhere on the new Trading Post. We made sure that the dialog is available anywhere items are shown on the Trading Post. This way you can always pull up the current market for an item without losing your hand-forged search query. This new dialog also tries to help guide you to a better understanding of the results of your actions. Now when buying or selling, you see your proposed listing reflected immediately in the UI alongside the existing listings. We’ve found that this can be very helpful in teaching players that are new to the Trading Post what all those inputs actually do, and act as a useful sanity check for experienced traders. Perhaps the most useful thing about the Trading Post is the ability to sell items from your inventory on it no matter where you may be in Tyria. Evon Gnashblade spent years and considerable resources building up the infrastructure necessary to allow you to sell your items from Tyria’s darkest and most inhospitable corners, and now you get to reap the rewards. I wouldn’t say he did it entirely for your benefit (that doesn’t sound like something he’d do), but it sure feels that way. When you’re out adventuring in the world, it’s almost always a better idea to sell your unwanted items and resources on the Trading Post than to give them to the nearest vendor. Since selling on the Trading Post is so useful to players, we knew that the experience we were building this time around would need to be top-notch. Pointing out that selling on the Trading Post is better than selling your items to a vendor is fine, but if the process is painful, users will rightfully ignore it. We had a lot of discussions around what selling on the Trading Post should be, and we’re very excited with where those conversations led us. The most obvious change to selling on the new Trading Post is that no longer are your items sorted by their name. Items are now shown in the same order they appear in your inventory. All your equipped bags are shown on the left-hand side for filtering, just like categories when browsing. The sell interface also respects invisible bag, allowing you to squirrel away your most prized possessions to keep them safe from accidental clicks. In case you’ve just finished a particularly rewarding dungeon or WvW battle and are overwhelmed with items, we’ve also built in real-time text filtering. Improving the visibility of the fees incurred while using the Trading Post was also important. Previously, we’d show you the listing fee and projected profit when selling, but this left out the successful exchange fee that comes out of the seller’s profit on every transaction. Feeding all those birds that shuttle your wares to the Trading Post isn’t cheap, or so Evon claims. It was better than nothing, but we got a lot of feedback that the projected profit was confusing because we weren’t calling out all the fees. The new selling UI in the Trading Post explicitly calls out both the listing fee and the exchange fee, so there shouldn’t be any surprises when selling. My Transactions hasn’t seen as many changes as the rest of the Trading Post, but we certainly haven’t forgotten it. The major difference is that it has been given the same side-navigation treatment as the others, putting the top-level filtering of current and historical transactions in front of you as simply as possible. There have also been some low-level organizational changes to how we fetch and display your listing data in order to make switching between those sections seamless and smooth. This reworking of the navigation makes getting a high-level view of your Trading Post interactions just that much easier. We’ve never really made a secret of the fact that the Trading Post is a very custom web application built for running inside the game. Building those pieces of the interface that way has provided us with a ton of benefits. It’s also brought with it a unique set of challenges, both in matching the rest of the UI and ensuring that performance is acceptable. 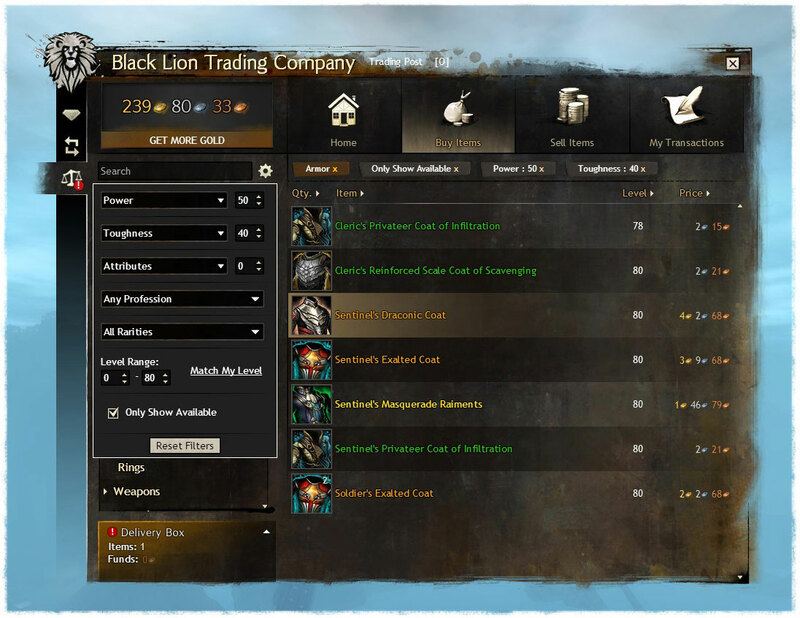 Definitely the most visible downside to that decision has been the slow initial loading for the entire Black Lion Trading Company panel. A huge part of the work we’ve done on improving the overall Trading Post experience has been focusing on performance from a technology perspective. To that end, we’re introducing a completely new browser engine into the game. When building the new Trading Post on top of this new, faster browser engine, we’ve also biased our technical decisions toward making things fast. When looking at the big picture of where time was spent when loading the old Trading Post, a few places that were very expensive stood out. We were able to gain huge performance improvements by updating the game client so that the embedded browser could access things the game already knows about. There’s no reason we should have to download an icon for an in-game item from the Trading Post servers; it’s already in the game files. This same optimization can also be made for basic item information like name, description, and vendor price. In the new Trading Post, we avoid going out to a server whenever possible, and the experience is faster and better for it. All of the underlying technical changes weren’t done solely for performance. Having had time to reflect on what we liked about the previous iteration of the Trading Post (and spending even more time on what we didn’t like about it! ), it became clear that a new approach was needed to ensure that improvements could continue to be made. The old Trading Post was made by a significantly smaller team on a very tight schedule, but this time around, we’ve had more people contributing and given ourselves much more time. It’s led to an objectively better product, one that we’re all very proud of. It’s also a product that is easier for us to ship fixes and updates on, which is hugely important to us. At ArenaNet, we strive to iterate on the things we build, both internally before we ship new features and externally after we’ve gotten feedback from our players. The Trading Post is no different. It’s taken some time for us to come up with this reworking, but we hope you enjoy using it as much as we’ve enjoyed building it. Remember, you’ll get to see the new Trading Post for yourself when the September 2014 Feature Pack goes live, so be sure to log in on Tuesday, September 9, and check it out!